Seana Mallen’s homage to George Caitlin’s 1850 painting. In 1844 Caitlin documented Mahaska’s journey to London with a group of thirteen other Ioway people. In 1848, my great-great grandfather Martin Snider erected the first cabin in Montezuma, Mahaska County, Iowa. The state of Iowa was named after the Ioway natives who split off from the Oneotas around 1650. In the early 1800s, through a series of treaties, the US government evicted the Ioways from their land. Mahaska County was named after the Indian Chief Mahaska, or White Cloud in English. My great-great grandfather used to tell the story of an Ioway Indian who knocked on the door and asked to borrow milk. The Ioway’s wife had died during childbirth. My grandfather agreed but admitted he was a bit perplexed when the man went into his barn and led his cow away. However he did not stop him. When the baby was weaned, the Ioway brought the cow back. Later during the “Indian uprising” my grandfather was the only settler in the area the Ioway did not attack. European colonists viewed the Native people as either vicious barbarians or as Noble Savages. The Noble Savage image dates back to Bartolome de Las Casa’s 1530 writings about American natives. 1987 American high school textbooks summarized this history. This American myth has lasted over five centuries. In the book 1491, Charles C. Mann calls it Holmberg’s Mistake. Historically the North American Indian population prior to Columbus was estimated to be around 1.15 million with a total of 8.4 million throughout the Americas. Mann outlines new evidence that points to an American population more likely between 90 to 112 million people. New estimates suggest by the sixteenth century, 80 to 100 million Indians were wiped out by the European smallpox. Mann also presents evidence the Indians were not just Noble Savages living off the land; rather they were active agents agriculturally shaping the land. Mann writes the Amazon rainforest is not wild. Rather this wet desert is the remnant of a large, managed landscape. The Native Americans were not simply farmers or hunters. In 1100AD, at the mouth of the Mississippi River was the port city called Cahokia. The largest concentration of people north of the Rio Grande, hundreds of high-peaked, deeply thatched roofs like those on traditional Japanese farms were built around a four-level earthen mound bigger than the Great Pyramid of Giza. Further south, the Mexican Olmec developed a dozen different systems of writing, established wide trade networks, tracked the orbits of planets, created a 365-day calendar more accurate than the Europeans’ and recorded its histories in books of folded bark paper. The Mexican capital of Tenochtitlan was larger than Paris. The South American Inka empire was bigger than the Ming Dynasty in China, Ivan the Great’s Russia, the Ottomon Empire and the Triple Alliance. The use of zero considered “one of the greatest single accomplishments of the human race” was first whispered around 600BC when the Babylonians tallied numbers in columns. India used a zero in the first few centuries AD. Europeans began using it in the 12th century when the Arabs brought it to them. The first recorded zero in the Americas was in a 357AD Mayan carving. Before that, a calendrical system based on the existence of zeros was used. 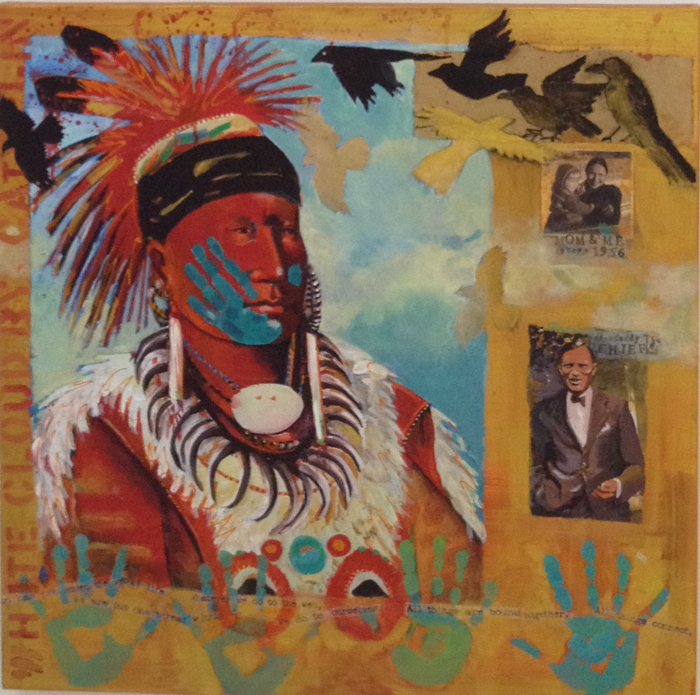 Seana Mallen’s painting is based on Edward Curtis’ photograph. Curtis’ life work was to document the tragic decline of the Native American peoples. “Man did not weave the web of life. He is but one strand within it. What we do to the web we do to ourselves. All things are bound together. All things connect.” Chief Seattle. I highly recommend 1491 to open your eyes to a new perspective on history. It is not the easiest read but it is very interesting. Currently on display during America Week, Seana Mallen’s paintings can be seen in the Seef Mall near the Starbucks. Very interesting indeed and i enjoyed the read so will have to put 1491 on my ‘To Read’ list. Have just finished a book about a WW2 resucue in New Guinea and the ‘finding’ of a hidden civilization in 1942 – Michael Zuckoff’s Lost in Shangri-La. I flew into the valley myself in 1987 and i wrote an article about the ‘stone age people’ in my book A String of Pearls – so it was good to ‘go back’ and visit again. On your material, it is also interesting to note that in 1992, in the Mabo judgement, the High court of Australia reversed all previous law by declaring that Australia was not Terra Nullius when Captain Cook laid claim to it in 1770 and settlement began in 1788 and that therefore the prior occupants, the aboriginals, had a right to native title. The Government brought in enabling legislation in 1993, much to the chagrin of mining and pastoral interests. PS -If you have had a chance to read my What the eye Cannot see, is there any chance of a brief review on Amazon.com – good or bad – all welcomed, with great relish … or mayonnaise! I will try to get to it soon. I have just finished “Birds Without Wings” for my bookclub. Like all book lovers, I have STACKS of books I intend to read. All fixed. And of course there were so many. Dragons are flamboyant creatures. We are not known for our spelling. I was just reading an interview Charles C. Mann gave. Here is a quote. Thank you Eva for being one of those light beings who are helping to honor the Native Americans and helping to clear the memories of the past. Aho..
And every day I discover there is something more to do. Thanks for the recommendation. I am very interested in ‘non-european’ views of world and cultural history so I, too, will put “1491” on my reading list. Seana’s work is lovely too! It is a VERY interesting read and shows you that scholarship is an evolving process. What was “truth” or fact 30 years ago changes as the same evidence is interpreted differently or from a new perspective. Research is obviously guided by the person who has an interest in the subject. And perhaps if the subject field of interest is narrow there may only be a handful of people motivated enough to do the research. So the one or two people who complete their project and present their findings become the experts. And in some cases their interpretation is the only one that is read or maintained. Reading 1491 I think that is the case with much of the Western/European view of “new world” history. In 1491 Mann outlines how the evidence presented by researchers from different disciplines have contributed to this story about life in the Americas before 1491. Mann is science writer not a scientist per se. What I think Mann successfully does is pull together evidence and studies from anthropologists, archaeologists, ecologists, geographers and historians and by crossing disciplines he weaves together a different narrative. Because the telling of “history” depends on who is telling the story, Mann’s interpretation is based on his ability as an outsider to objectively incorporate the best practices in each discipline. Unlike professional academics whose livelihood is based upon the right-ness of their research, Mann can let go of historical studies that are dated based upon newer research which perhaps use better methods. Mann writes in the introduction the book “is not a systematic, chronological account of the Western Hemisphere’s cultural and social development before 1492. Such a book, its scope vast in space and time, could not be written” (by him). BTW since 1491, he has written another book called 1493. I haven’t read it yet. Just as a side note. The issue of appropriate vocabulary to use while writing or discussing the American peoples is a whole essay in itself. In fact, Mann’s Appendix A “Loaded Words” is about the subject. Mann says he tried to refer to the indigenous people by the names they called themselves. And from his perspective, “the overwhelming majority” describe themselves as Indians. I just read this interview and Mann says the same thing I just wrote to you. “I’m not sure, but I’ll give you my guess. Scholars of the 19th century and the first part of the 20th wrote at a time when European nations were flattening everything before their path. It was natural to assume that non-white peoples were history’s losers, unimportant in the scheme of things. After the Second World War, in which a nonwhite nation (Japan) proved a difficult adversary, researchers took stock. And then when the great European empires crumbled, they began to look again at the histories of these other societies. Here is the full interview. It is very interesting and highlights some of the key issues in the book. It will help understand the context he writes from.